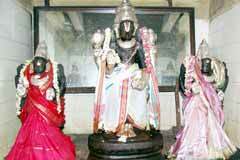 There are three sanctum sanctorum in the temple, the one for Lord Brahmma with His consorts Mother Saraswathi and Mother Gayatri in a standing posture seeking the blessings of Lord Vedanarayana Perumal, the second for Lord Veda Narayanaperumal accompanied by His consorts Mothers Sridevi and Bhoodevi and the third is for Lord Yoga Narasimha with His two consorts. Thus, the devotee can have the darshan of three Lords in the temple. 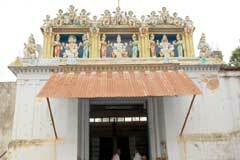 The temple is open from 8.00 a.m. to 11.30 a.m. and from 5.30 p.m. to 9.00 p.m.
Sri Brahmman Temple, Kumbakonam-612 001, Thanjavur district. The temple conducts Brahmma Sankalpa Puja educational and trade progress boons. 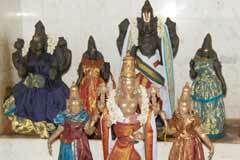 Devotees perform special pujas for Lord Brahmma and Mothers Saraswathi and Gayatri before admitting children to school. Special pujas are performed during Thursdays. Pujas are performed for Mother Mahalakshmi on Fridays and Perumal on Saturdays for relief from debt burdens. 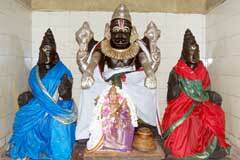 Homas are performed for Lord Yoga Narasimha by devotees for longevity on their 60th, 70th and 80th birthday occasions. covering the three Lords. There are many stories about Brahmma, that he took the form of a swan to find the head of Lord Shiva but failed. To hide the defeat, He lied that he had seen Shiva’s head. Also, as Mother Parvathi mistook Brahmma for Shiva as both had five heads then, to avoid the confusion, one head of Brahmma was removed reducing to four. Thus, worship of Brahmma was discontinued. But according to philosophy, one born should finally reach the Creator Himself. Brahmma is the Creator and also He is the one protecting the Vedas by chanting them by His four tongues. He enjoys His own importance in the scriptures. 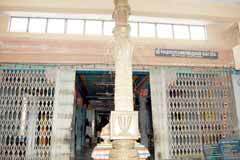 Among the few such temples dedicated to Him, the Brahmma temple in Kumbakonam is one. 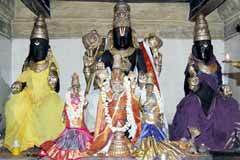 He graces here the devotees with His consorts Mothers Saraswathi and Gayatri. It is widely common that many are proud of their high learning barring a few and Lord Brahmma was no exception to this mentality. He thought that He alone can create which Lord Shiva and Vishnu cannot. Knowing this, Lord Vishnu sent a ghost (Bhooda) to Brahmma who trembled on seeing the creature. He ran to Lord Vishnu saying that a ghost not created by Him was threatening and sought protection. Lord Vishnu said that it was created by Him to check his pride and that he would also forget the art of creation. When begged for a remedy, Lord Vishnu suggested that he go to Earth and perform penance. 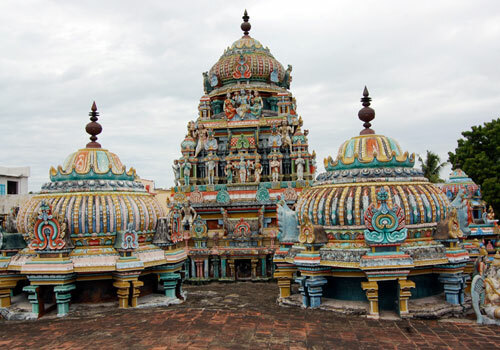 Brahmma chose this place, Kumbakonam that stays stable even after the destroying Pralaya floods. All the Devas assisted Brahmma in his penance. Pleased with Brahmma’s penance, Lord Vishnu appeared before him, taught the Vedas and reinstated Brahamma to his earlier status. 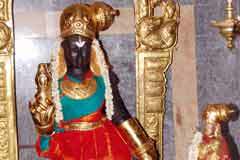 Perumal became Lord Veda Narayana Perumal and Mother Vedavalli. To facilitate the final bath of Brahmma and the Devas after the penance, Perumal created a river with His club known as Hari Sollaru which later days faced changes and it is Arasalaru today. 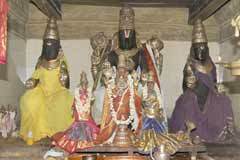 Miracle Based: Lord Brahmma with His consorts Mother Saraswathi and Mother Gayatri in a standing posture seeking the blessings of Lord Vedanarayana Perumal, the second for Lord Veda Narayanaperumal accompanied by His consorts Mothers Sridevi and Bhoodevi and the third is for Lord Yoga Narasimha with His two consorts. Thus, the devotee can have the darshan of three Lords in the temple. 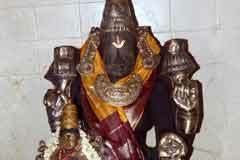 The temple is just 2 km far from Kumbakonam near the Uchi Piallayar (Vinayaka) temple. People know this place only as Brahmman Koil.